A troubled production and genetically-confused origins are to blame for this unpolished and overscripted failure, which wants to be Chinatown but ends up looking like cheap television. The miasma led New York Times critic Vincent Canby to write of the film: 'heaven only knows what it's supposed to be about or why it was made.' In its conceit of the detective-writer turning detective, it doesn't even work as pastiche, and its presumptions towards John Huston's 1941 film version of Dashiel Hammett's The Maltese Falcon fail miserably. 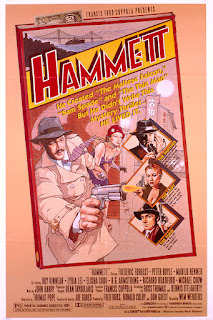 Hammett's men of nails are replaced by catamites, cabalistic capitalists, and giggling concubines, and his masterfully laconic descriptions are reduced to hackneyed gin-joints and (necessarily) foggy wharves. In trying to figure out why Hammett is surrounded by these people, and what they're meant to be doing, you can easily miss the fact that most of the performances are actually excellent. The elderly duo of Elisha Cook (who played the young punk in Huston's film), and Sylvia Sidney (who also acted alongside Bogart that year in the disappointing The Wagons Roll at Night) remind us how badly this film stands next to the film noir greats. And an interesting performance comes from Marilu Henner, the female lead, a librarian. For those who would maintain that film librarians are overworked stereotypes, you'd be hard-pressed to work out which boilerplate she's stamped from. 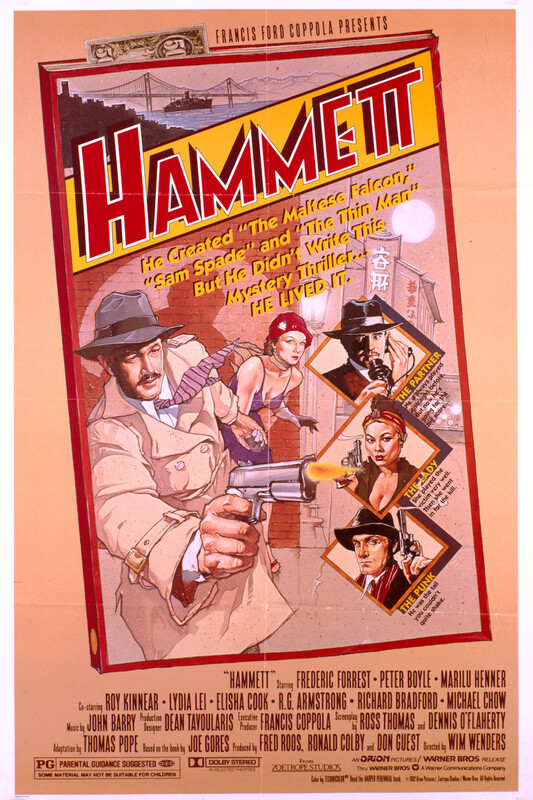 She spends most of the film lounging around Hammett's apartment in a state of partial undress, or visualized in his daydreamed stories as a tough independent woman, holding her own in a world of gangsters, corrupt cops, and mean gumshoes. She drinks whiskey, dries her knickers on a line outside her front door, never talks about (or goes to) work, and is untroubled by the sight of blood. In fact, she's the most Hammett-like character in the whole film. Given the robustness of his fictional creations, one must wonder what the filmmakers thought they were adding by fictionalizing the detective's own life, turning him into a cipher, and the stories he created into plywooded melodrama.